This is a long hike which starts at the city of Plav (968 m), climbs up to Bor Peak (2106 m), and finishes at the village of Vusanje (1022 m). This hike could be divided into two parts through staying an overnight at Kolenovica Katun (UTM 34 T 408166 4709032) where shepherds can be found during the summer time. From Bor summit, follow the ridge northwest and head down from the saddle where Kolendarsko lake lies. This katun lies down the Kolendarsko lake and has drinkable water over the whole summer. This trail is numbered 552 in the national trail network. It begins at the traffic circle in front of the old mosque in Plav (WP 1h). Posted signs can be found pointing towards the southern direction. Upon crossing towards Đuricka Rijeka (Djuricka river), there is a road to the village Zaviš 30 m after the mosque. This part of the trail is simultaneously a mountain bike path. Along the trail, you will come to a place known as Radunov laz which contains a spring of drinkable water and wonderful view points towards Lake Plav, the Ljuča river, Visitor Mountain, and the town of Plav. This is a suitable place to take a rest after hiking 4.5 km from the starting point. Afterwards, the trail goes along a good path through the woods until Gradec hill, at which point the trail turns southwest after the second curve towards Karaula Feratovica (1664 m). Here we enter the territory of Prokletije National Park. This is also a view point looking over the wider region surrounding Lake Plav, the Kofiljaca, and Visitor mountains, and the Djuricka river. From that point, along the eastern hillside of Bairak hill, the trail leads to Katun Paljvukaj (not on the map). During the summer months, visitors can taste homemade products and experience local culture here. After 8.5 km of hiking, this is a good place for taking the next break and refilling your water reserves. From Radunov laz until Katun Paljvukaj, the trail goes through mixed forests of spruce, fir and beech trees included in the territory of Prokletije National Park. Following west towards the Bairak hilltop (2074 m), the trail leads over the northeast ridge of Maja e Borit to the Bor pass which contains a small lake. The next point is Bor Peak (2106 m), which we reach along a grassy ridge covered with plenty of wild blueberries for us to sample. In total, we have now hiked 15.5 km. Along the 3 smaller lakes, we are moving southeast towards the southern peak of Bor Mountain (above the Katun Mala Scapica) to the boundary park viewpoint (2149 m). From there, you can see the Cerem valley, the Kolata massif, Lake Plav, northeast towards Hajla Mountain, and the Komovi and Karanfili mountains. 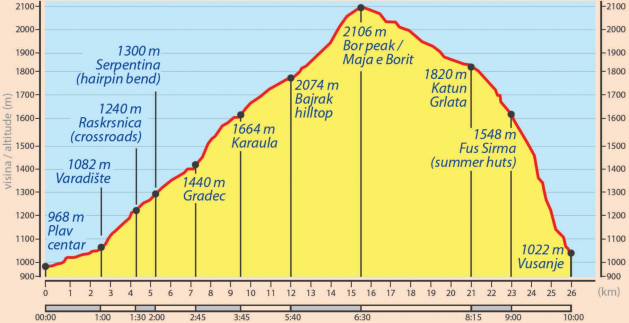 Downhill, in the southern direction, the trail goes towards the Katun Grlata (Buni Cesalj) while passing a series of destroyed military block houses. This place is temporarily populated during the summer months and is a nice point to have a rest or camp, two water springs being located close to the katun. An extra day of hiking (in addition to the regular PoB trail) affords the possibility to hike to the Zla Kolata (2535 m) peak through the Skripa valley and Preslopit (2039 m) pass. The northwest chamber of Preslopit leads to the triple pass (2526 m), and then to the very top of Kolata (Maja e Keq) (2535 m) Peak. The hike is long - approx. 4h in one direction. It is necessary to have full hiking and alpine equipment. Hiring a local guide is recommended. Following a good path (used to bring the cattle to katuns), you will reach the village of Vusanje (Vuthaj) at WP 3i after approx. 7 km, or 3 hours walking. Accommodation can be found here. Close to Vusanje, you can find a wonderful waterfall fed by the Grlja river. An overnight stay and rest for the next day’s hike towards Theth is suggested.